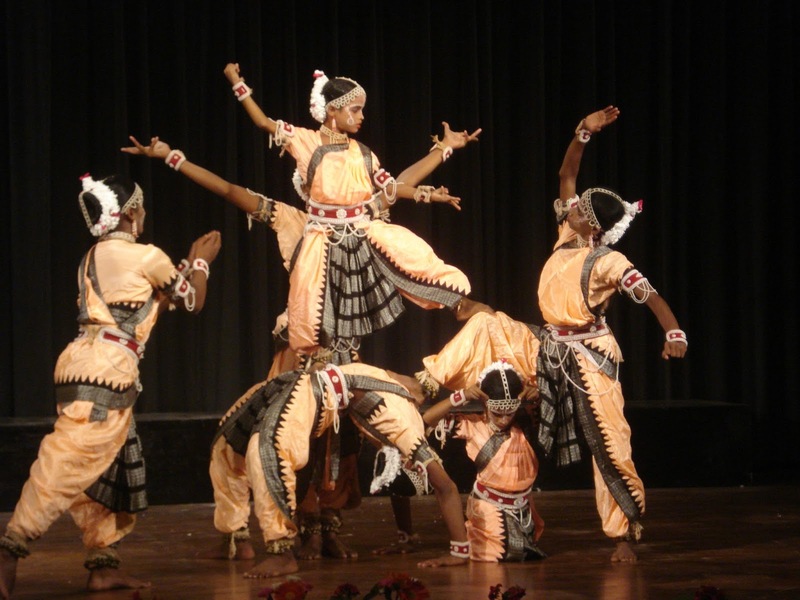 Gotipua is a traditional dance form in the state of Orissa, India, and the precursor of Odissi classical dance. It has been performed in Orissa for centuries by young boys, who dress as women to praise Jagannath and Krishna. The dance is executed by a group of boys who perform acrobatic figures inspired by the life of Radha and Krishna. The boys begin to learn the dance at an early age until adolescence, when their androgynous appearance changes. In the Oriya language Gotipua, means "single boy" (goti-pua).Raghurajpur, Orissa (near Puri) is an historic village known for its Gotipua dance troupes.To transform into graceful feminine dancers the boys do not cut their hair, instead styling it in a knot and weaving garlands of flowers into it. They make up their faces with mixed white and red powder. Kajal (black eyeliner) is broadly applied around the eyes to give them an elongated look. The bindi usually round, is applied to the forehead, surrounded with a pattern made from sandalwood. Traditional paintings adorn the face, which are unique to each dance school. The costume has evolved over time. The traditional dress is a Kanchula, a brightly coloured blouse with shiny decorations. An apron-like, embroidered silk cloth (nibibandha) is tied around the waist like a ruffle and worn around the legs. Some dancers still adhere to tradition by wearing a pattasari: a piece of thin fabric about 4 metres (13 ft 1 in) long, worn tightly with equal lengths of material on both sides and a knot on the navel. However, this traditional dress is often replaced by a newly designed cloth which is easier to put on. Dancers wear specially designed, beaded jewelry: necklaces, bracelets, armbands and ear ornaments. Nose-piercing jewelry has been replaced with a painted motif. Ankle bells are worn, to accentuate the beats tapped out by the feet. The palms of the hands and soles of the feet are painted with a red liquid known as alta. The costume, jewelry and bells are considered sacred. Long ago, the temples in Orissa had female dancers known as devadasi (or mahari), who were devoted to Jagannath, which gave rise to Mahari dance. Sculptures of dancers on bas-reliefs in temples in Orissa (and the Konark Sun and Jagannath Temples in Puri) demonstrate this ancient tradition. With the decline of mahari dancers around the 16th century during the reign of Rama Chandra Dev (who founded the Bhoi dynasty), boy dancers in Orissa continued the tradition. Gotipua dance is in the Odissi style, but their technique, costumes and presentation differ from those of the mahari; the singing is done by the dancers. 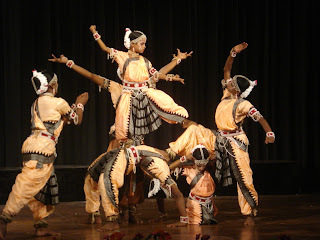 Present-day Odissi dance has been influenced by Gotipua dance. Most masters of Odissi dance (such as Kelucharan Mohapatra, from Raghurajpur) were Gotipua dancers in their youth. Odissi dance is a combination of tandava (vigorous, masculine) and lasya (graceful, feminine) dances. It has two basic postures: tribhangi (in which the body is held with bends at the head, torso and knees) and chouka (a square-like stance, symbolizing Jagannath). Fluidity in the upper torso is characteristic of Odissi dance, which is often compared to the gentle sea waves which caress the Orissa beaches.Each year, the Guru Kelucharan Mohapatra Odissi Research Centre organizes the Gotipua Dance Festival in Bhubaneswar.